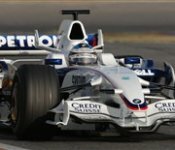 With the third day of testing in Barcelona the team basically concluded the preparation for the 2008 season. In perfect weather conditions Robert Kubica and Nick Heidfeld worked again on the set-up of the BMW Sauber F1.08 evaluating the latest aerodynamical updates for the upcoming race in Melbourne/Australia. Both drivers also conducted several practice pitstops and starts. In the morning Nick Heidfeld did a precautionary stop on the track because sensors were indicating a gearbox problem. Covering 189 laps (880 km) and 213 laps (992 km) respectively over the three days period Kubica and Heidfeld continued development work on the team’s new car as scheduled. Test driver Christian Klien completed another 42 laps (196 km) on the first day.